Two letters from our October edition on the Stanford Prison Experiment controversy. We, the undersigned researchers who conducted the Stanford Prison Experiment (Philip Zimbardo and Craig Haney) and BBC Prison Study (Alex Haslam and Stephen Reicher), recognise that our studies, results and public statements have engendered strong debate and, at times, misunderstanding within and beyond psychology. In an effort to promote constructive scientific dialogue, we are therefore releasing this consensus statement to highlight common ground and clarify our views on the research in question. First, we jointly believe that it is critically important to develop a scientific understanding of toxic human behaviour, including brutality and the abuse of authority and power. Second, we regard the Stanford Prison Experiment and BBC Prison Study as valid studies and valuable resources for advancing such understanding. At the same time, we recognise that both investigations have methodological limitations and are best viewed as one-trial demonstration studies rather than traditional experiments. Third, the BBC Prison Study differs from the Stanford Prison Experiment in essential ways and is not a direct replication of the earlier study. We do, however, see value in comparing the different outcomes of the two studies (and others) as a means of advancing conceptual understanding. Fourth, the behaviours observed in the Stanford Prison Experiment and BBC Prison Study were a function of many factors, including roles, norms, leadership, social identification, group pressure and individual differences, not all of which are necessarily mutually exclusive. It is only natural that explanations of social behaviour will be complex and multifactorial. Fifth, we believe in open science and welcome the public release of information that aids in the interpretation of these and other studies. Sixth, we encourage others to investigate, discuss, and teach about the roots of toxic behaviour and effective ways to prevent it. Seventh, we regret instances in which our statements appeared to involve ad hominem criticisms or used intemperate language. Although it is legitimate to debate the accuracy, comprehensiveness and meaning of research reports, we have no definitive evidence that any signatory of this statement committed scientific fraud or deliberately misled others about their research findings. 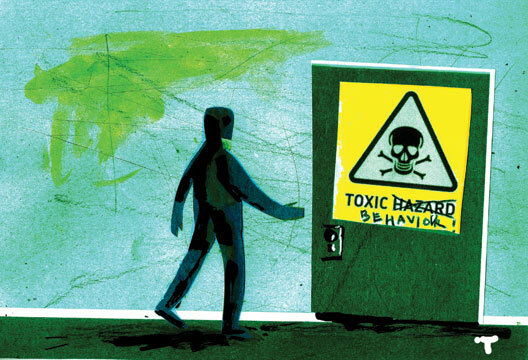 Eighth, we hope that future discussions and debates about our research and other studies of toxic behaviour will be open, collegial and respectful of differing points of view. It was a great relief to read the letter about the Stanford Prison Experiment (‘Breaking free from Stanford’, August 2018) as what it reveals is consistent with my 25 years professional organisational psychology practice dealing with toxicity at work. I have not seen toxic workplace behaviour created merely by role allocation (or due to individual character without the necessary power), even though that is often the answer the person commissioning me wants to me come up with, so I have always been sceptical of the prison experiment. The use of this wider contextual evidence offers the hope of a more robust integration between what the science indicates and what in practice I have found to be helpful when intervening. What I have witnessed in practice as the precursor to toxic workplace behaviour is a combination of anxiety about maintaining paid work in increasingly insecure jobs, excessive work demand coupled with lack of support, and the activation of social identity threats (e.g. through restructuring or embedded in the design of various HR processes). When this combines with leader encouragement (often as a failure to sanction problematic actions), it both escalates and leads to those who raise concerns being subjected to disciplinary action or the complaints process and managed out of the organisation. Based on my work addressing the psychosocial preconditions for workplace toxicity and ill health and my work with the Society on whistleblowing, I have just been appointed to the HSE Workplace Health Expert Committee. This review of the prison experiments supports the broader experience from practice that I will use in this role and so from my perspective is very timely and will inform my input to this committee. In my view, the original formulation of the SPE rather misdirected intervention attention to role design rather than at the wider contextual factors that I have found in practice to ameliorate such toxicity. I believe that these details of the complex interacting variables at play in the prison experiment are important as they offer a fuller and more complex guide for intervention. The godfather of the sexual revolution?